This report describes a four-day-old, full-term Connemara colt, presented for the evaluation of a progressive inability to rise unassisted. A diagnosis of nutritional muscular dystrophy was made based on muscular weakness, elevated muscle enzymes and low vitamin E, selenium and glutathione peroxidase activity. The foal was treated with intramuscular vitamin E-selenium and made a full recovery. Nutritional muscular dystrophy (NMD), also known as white muscle disease or nutritional myodegeneration, is a non-inflammatory degenerative disease affecting both skeletal and cardiac muscles, with animals presenting either in an acute or subacute form [6, 13, 16]. It is most commonly observed in regions in which there is selenium (Se)-deficient soil, grains and forages [6, 13]. The clinical presentation includes an acute and rapidly progressive syndrome leading to death within hours to days, or a subacute form in which muscular weakness is the most common presentation [16, 13]. NMD has been reported in cattle, sheep and pigs, occurring less frequently in horses, in various regions in the United States, Canada, the United Kingdom, New Zealand, Australia and Europe . It has also been reported to affect foals ranging in age from neonates to older weanlings . We report a case of diffuse muscular weakness in a four-day-old foal in which NMD was diagnosed based on the clinical presentation and laboratory findings including low serum vitamin E and Se concentrations. Although selenium toxicity has been reported in horses (as well as cattle and sheep) in the Republic of Ireland , to the authors' knowledge this is the first report of NMD in a foal in the Republic of Ireland. A four-day-old, full-term 45 kg Connemara colt presented to University College Dublin (UCD) with a two day history of progressive inability to rise unassisted. Gestation and parturition were reportedly uneventful, and although there was mild flexor contraction of all four limbs, the foal could stand and nurse easily on its own. The mare was maintained on a grass pasture with no supplements. Deworming and vaccination history were unknown and there had been no dietary or management changes. The mare had one previous healthy foal. At two days' of age, the foal was observed having trouble rising on its own; the following day, the foal could not get up without assistance, appeared to be weaker and passed tea-coloured urine. The foal was referred into UCD the following day. Upon presentation, the foal was bright, alert and standing. When recumbent, it needed assistance to stand, but once up, could move around without assistance. The foal had normal nursing behaviour and when suckling, swallowed normally. All joints and the umbilicus palpated within normal limits, and there was moderate flexural contraction of all four limbs involving primarily the distal interphalangeal joint, with the right front the most severely affected. The flexural deformities did not appear severe enough on their own to cause the foal's inability to rise without assistance. The foal was observed to urinate frequently in normal quantities with no straining; the urine grossly appeared to be normal. The mucous membranes were pink and moist with a capillary refill time of less than two seconds, and temperature, pulse and respiration were all within normal limits. Observing the colt's hindlimbs from the side, they appeared to be in a 'C'-shaped configuration with a downward slope of the pelvis (Figure 1). The remainder of the physical examination, including a neurological examination, was within normal limits. No signs of trauma were noted and no ectoparasites were found. A four-day-old full-term Connemara colt that presented to University College Dublin with a two-day history of progressive inability to rise unassisted. Note the moderate flexural contraction of all four limbs involving primarily the distal interphalangeal joint and the 'C'-shaped configuration of the hindlimbs and downward slope of the pelvis. Based on the physical and neurological examination, the primary problem appeared to be generalised muscular weakness. Differentials at this time for muscular weakness included systemic illness (sepsis, neonatal isoerythrolysis), neuromuscular abnormalities (tick paralysis, botulism), musculoskeletal abnormalities (myopathies secondary to inflammatory/infectious, traumatic, degenerative [inherited, metabolic, nutritional] and ischaemic causes, incomplete ossification of the cuboidal bones), dysmaturity, metabolic/electrolyte derangements (hyperkalaemia, hypokalaemia, hypocalcaemia) and endocrine disorders (hypoadrenocorticism, hypothyroidism). Although the foal appeared to be weak rather than ataxic, congenital disorders of the vertebrae/spinal cord and trauma to the vertebrae/spinal cord including the pelvis could not be ruled out. Blood was submitted for a complete blood count (CBC) including fibrinogen, serum biochemistry, venous blood gas, immunoglobulin G (IgG) concentrations and aerobic and anaerobic bacterial culture. Radiographs taken of the hocks and carpi revealed normal ossification, while radiographs of the distal limbs showed no congenital abnormalities which might explain the presence of the flexural deformities. Radiographs taken of the lumbosacral spine revealed no evidence of trauma. The IgG concentration was 400 mg/dl (4 g/l) (reference range >800 mg/dl [>8 g/l]) indicating partial failure of passive transfer. The blood culture yielded no growth after one week of incubation. The CBC was unremarkable, while the serum biochemistry revealed a profound hyponatraemia (118 mmol/l; reference range 132-146 mmol/l), hyperkalaemia (4.52 mmol/l; reference range 2.7-3.5 mmol/l) and hypochloraemia (85 mmol/l; reference range 98-104 mmol/l), and a severely elevated creatinine phosphokinase ([CPK] 2450 iu/l; reference range <70 iu/l) and aspartate aminotransferase ([AST] 4970 iu/l; reference range 101-154 iu/l); the blood urea nitrogen (BUN) and creatinine concentrations were within normal limits. The main differentials for foals with hyponatraemia, hyperkalaemia and hypochloraemia include uroperitoneum due to rupture of part of the urinary tract (most commonly bladder), renal disease and muscle degeneration (rhabdomyolysis). Adrenal insufficiencies, as well as gastrointestinal (GI) diseases such as enterocolitis were also considered, but given both the lack of historical evidence and clinical signs, GI diseases were considered unlikely to be involved. The main differential for elevations in serum CPK and AST is a myopathy (inflammatory/infectious [sepsis, clostridial myositis], traumatic, degenerative [inherited, metabolic, nutritional], ischaemic). Causes of inherited myopathies include polysaccharide storage myopathy and glycogen branching enzyme deficiency while nutritional causes include NMD. Ultrasonography of the abdomen including both kidneys demonstrated an intact bladder with no free fluid. A free-catch urine sample was examined revealing a specific gravity of 1.006, with no evidence of blood. Renal disease was considered unlikely since there was no evidence of azotaemia, and the low urine specific gravity was considered to be normal in a nursing foal. Although neonates can adequately concentrate their urine, they typically have very dilute urine (1.001-1.006) due to their almost completely liquid (i.e., milk) diet. Based on the above findings and the elevated serum muscle enzymes, rhabdomyolysis was considered to be the cause of the electrolyte disturbances, although adrenal insufficiency could not be completely ruled-out. Based on the signalment, clinical, laboratory and radiographic findings infectious, traumatic, inherited and ischaemic causes of myopathy in this foal were all considered unlikely with the primary differential being NMD. An intravenous jugular catheter was placed and treatment initiated including 0.9% sodium chloride and 5% dextrose (2.2 ml/kg/hr, IV), ceftiofur HCl (Excenel, Pfizer Animal Health) (2.2 mg/kg, IV, q 12 h) and omeprazole (Gastroguard, Merial)(4 mg/kg, PO, q 24 h). A dextrose-containing solution was chosen in an attempt to reduce serum potassium concentrations by driving potassium into the cells. Despite evidence of partial failure of passive transfer, the owner declined treatment with intravenous plasma based on financial costs, the lack of evidence of sepsis and that fact that the foal was on systemic antibiotics. The foal was assisted to stand every two hours and nursing, urination and defecation were monitored. The following day, the foal was stronger, but still could not rise unassisted. A repeat CBC and serum biochemistry revealed the foal still to be hyponatraemic (123 mmol/l), hyperkalaemic (4.33 mmol/l) and hypochloraemic (88 mmol/l) with elevated serum muscle enzymes (CPK 648 iu/l; AST 3485 iu/l). Results from urine collected prior to fluid therapy and submitted for sediment analysis and fractional excretion of electrolytes were within normal limits. A repeat venous blood gas revealed a mild metabolic acidosis (pH 7.3, reference range 7.35-7.45; HCO3- 20.8 mEq/l, reference range 22-26 mEq/l), possibly due to lactic acid release from muscle and alterations in strong ions (i.e., hyponatraemic acidosis). To investigate for nutritional causes (i.e., NMD), blood was submitted from the mare and foal for measurement of vitamin E (two samples taken at different times of the day), Se and glutathione peroxidase (GPx). The owner declined a muscle biopsy due to financial restrictions. Baseline cortisol was also measured from blood samples taken at two different times to assess the adrenal function. The foal was then treated with a vitamin E-Se combination (Vitesel, Norbrook Laboratories Limited) (2.5 mg Se [2.5 mg/45 kg], IM, once, divided into two deep injections given in the semimembranosus muscles). 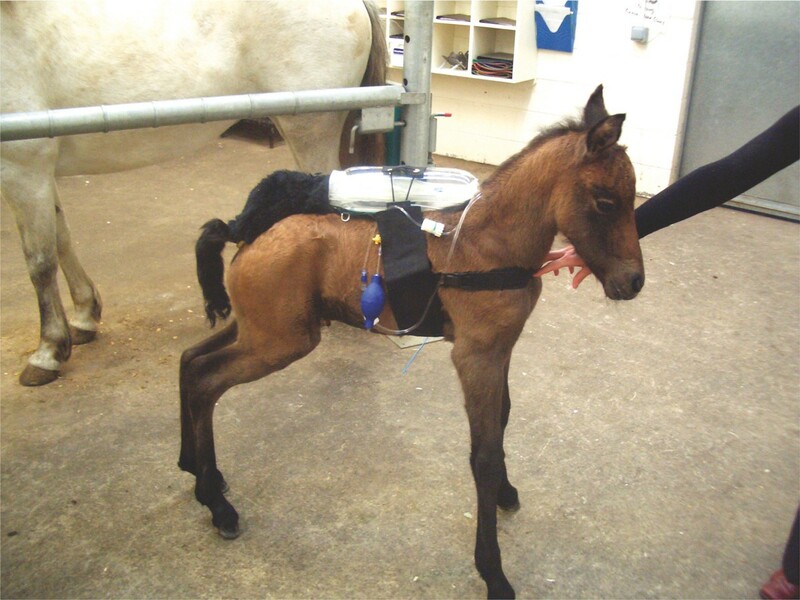 As the foal was tolerating the fluid load, intravenous fluid therapy was continued at the same rate but changed to a solution containing a total of 234 mEq/L of sodium with bicarbonate and dextrose (NaHCO3, 90 mEq added to 10% dextrose in 0.9% saline, 1 L) to help drive potassium intracellularly. Carprofen (Rimadyl, Pfizer Health Corp) (0.7 mg/kg, IV, once) was also given to address any inflammation and pain associated with muscle degeneration and with the flexural contractions. The foal also received physical therapy on the contracted tendons two to three times per day. By the third day the foal was brighter, able to get up unassisted, moved around the stall more freely and appeared less contracted with less sloping of the pelvis. A repeat venous blood gas, CBC and serum biochemistry including the sodium (135 mmol/l), potassium (3.86 mmol/l) and chloride (97 mmol/l) concentrations were all within normal limits. The serum CPK (493 iu/l) and AST (1340 iu/l) concentrations had both decreased significantly, indicating both resolution and lack of ongoing muscle damage. The foal's cortisol concentrations were within normal limits, while the GPx (10.1 u/ml PCV; reference range 30-150 u/ml PCV), blood Se (0.5 μmol/l; reference range 0.75-3.0 μmol/l) and serum vitamin E (2.1 μmol/l from first sample, 1.4 μmol/l from the second sample; reference range 3.0-20.0 μmol/l) concentrations were all low, supporting the diagnosis of NMD; the mare's GPx (38 u/ml PCV), blood Se (1.94 μmol/l) and serum vitamin E (5 μmol/l) concentrations were all within normal limits. Based on the normal electrolyte concentrations and decreasing muscle enzymes, intravenous fluids were discontinued. The following day, the foal remained bright and alert and able to get up on its own, with all serum electrolyte concentrations within normal limits. and both the serum CPK (280 iu/l) and AST (1026 iu/l) concentrations further decreased. The foal was administered a second treatment of vitamin E-Se (2.5 mg Se, IM, once) and carprofen (0.7 mg/kg, IV, once) and discharged on the sixth day of hospitalisation. In order to minimise muscle damage secondary to exertion, and to allow for continued muscle healing, it was instructed to keep the mare and foal stall-restricted for at least one week, followed by turn-out into a small paddock. It was recommended to treat the foal with vitamin E-Se at 10 days and six to eight weeks of age and also to supplement the animal with oral vitamin E since the intramuscular formulation contains very little. Although the mare's GPx, blood Se and serum vitamin E concentrations were all within normal limits, it was suspected that the mare had been deficient at one point during gestation since a foal's vitamin E and Se status are directly affected by the mare's status. Thus, it was recommended that vitamin E and Se be measured for the rest of the herd, especially for any remaining pregnant mares, and to supplement any of the deficient pregnant mares prior to parturition along with treating their foals with vitamin E-Se when born, and again at two and six weeks of age. Since Se toxicity can occur, it was recommended that the dose of Se not exceed 200 μg/kg in foals. Fifteen months following discharge the colt was reported doing well, with no problems with the remainder of the herd. NMD is a non-inflammatory degenerative disease affecting both skeletal and cardiac muscles, with animals presenting either in an acute or subacute form [6, 13, 16]. Although Se toxicity has been reported in horses (as well as cattle and sheep) in the Republic of Ireland and Se deficiency has been reported to be widespread in cattle and sheep in most of the counties in the Republic of Ireland , to the authors' knowledge this is the first report of NMD in a horse in the Republic of Ireland. The disease occurs in regions with Se-deficient soils, resulting in the production of Se-deficient grains and forages [6, 13, 16]. In the equine and other species, NMD is also associated with vitamin E deficiency . Vitamin E and Se act synergistically to prevent peroxidative damage of lipid-containing membranes, with vitamin E inactivating oxygen-free radicals while Se is a component of the enzyme glutathione peroxidase which acts to destroy already formed oxygen-free radicals [3, 13]. Typically, foals with subacute NMD are bright and alert with profound muscular weakness as seen with the foal described here [6, 13, 16]. Foals that have myocardial, as well as skeletal muscle degeneration, may present with an arrhythmia, tachycardia and profound weakness that may result in sudden death . In addition to general muscular weakness, animals may present with dysphagia resulting in secondary complications such as aspiration pneumonia and failure of passive transfer [6, 16]. The foal described here did have partial failure of passive transfer, but did not have clinical evidence of dysphagia nor aspiration pneumonia, although endoscopy and thoracic radiographs were not performed. Full and partial failure of passive transfer may occur due to inadequate colostral immunoglobulin concentration (decreased production, premature lactation), inadequate colostral intake (failure to suckle, dysphagia) and poor gut absorption. Although the foal had been observed by the owners to stand and nurse normally following parturition, it is possible that the foal did not take in adequate amounts of colostrum before gut closure due to an inability to rise and nurse as frequently as a normal foal would. Interestingly, it has been demonstrated that mares supplemented with a synthetic form of vitamin E resulted in an increased passive transfer of immunoglobulins to foals, likely as a result of increased concentrations of immunoglobulins in their colostrum [9, 10]. Therefore, mares with low vitamin E may have decreased concentrations of colostral immunoglobulins contributing to failure of passive transfer to the foal. The diagnosis of NMD is based on a combination of typical clinical signs, elevated muscle enzymes, decreased blood Se and/or GPx activity and response to treatment with vitamin E-Se [6, 16]. Muscle biopsies may be useful in defining characteristic histological lesions such as hyaline degeneration, lysis and fragmentation of muscle fibres , although alone they are not diagnostic. Serum CK and AST values are typically elevated in foals with NMD [6, 13, 16, 17], as found in the current case. CK is the most muscle-specific enzyme and indicates active muscle damage as it increases quickly (four to six hours) following muscle damage and has a relatively short half-life (six hours), returning to normal within 48 hours after muscle damage has stopped . In most foals, recumbency will not result in CK activity greater than 1000 u/L, while CK activity greater than 5000 u/L typically indicates myodegeneration . Although not performed in the present case due to financial restrictions, serum cardiac muscle isoenzymes (CK, LDH) and serum troponin I can be measured to evaluate for myocardial damage. Rhabdomyolysis often contributes to the development of hyponatraemia, hyperkalaemia and hypochloraemia. As the musculature makes up approximately 55% of the total body mass  and is a major intracellular reservoir for potassium and phosphorus, disruption of the muscle cell wall allows a large efflux of these intracellular electrolytes and an influx of water, sodium and chloride into the muscle tissue resulting in the above described electrolyte disturbances [2, 17]. These electrolyte changes typically coincide with the onset of clinical signs and increase in CK activity in foals with acute rhabdomyolysis . However, because of the development of myoglobinuria as a result of muscle breakdown, foals with acute rhabdomyolysis may develop secondary acute renal failure as a result of pigment nephropathy. Thus, foals with acute rhabdomyolysis need to have their renal function closely investigated and monitored during the duration of the disease process. The activity of GPx, a Se-containing enzyme, strongly correlates with blood Se concentrations , since Se is incorporated into red blood cells (RBC) as GPx during erythropoiesis . Thus, GPx activity is a good indicator of the animal's Se status weeks to months prior to the sample collection  while blood Se concentrations assess the animal's current Se status [16, 13]. Foals deficient in Se, such as the foal described in this report, will have low GPx activity when RBCs that had matured in a period of adequate Se are replaced with RBCs that had matured during a period of Se deficiency . However, neither a decreased blood Se nor GPx activity alone is sufficient for the diagnosis of NMD, since animals raised in Se-deficient areas with no clinical signs of NMD may have decreased blood Se and/or GPx activity [6, 12, 16, 20]. The main treatments for foals with NMD include intramuscular injections of vitamin E and Se products, exercise restriction and supportive care [6, 13, 16]. Since the injections can cause transient muscle pain, it is recommended to divide the dose and give into deep muscles at two separate sites [6, 14]. The amount of vitamin E in currently available combined vitamin E-Se products is minimal, so if NMD is believed to be due to vitamin E deficiency, then supplementation with additional vitamin E is recommended. Interestingly, although there appears to be a joint role for vitamin E and Se in the prevention of NMD, Se given alone has been shown to be effective in treating and preventing the disease . Mildly affected foals, such as in this report, improve rapidly following Se injections even though there is a significant delay before improvements in GPx activity can be documented . Since acute Se toxicity can occur, it is recommended not exceed 200 μg/kg in foals . Clinical signs of acute toxicity include depression, ataxia, muscle weakness, blindness, diarrhoea, dyspnoea and a garlic odour to the breath [6, 22, 23]. Hyperkalaemia may be the most life-threatening electrolyte abnormality in foals with NMD due to the possibility of cardiac arrhythmias. Typical treatments for hyperkalaemia include the use of glucose, sodium bicarbonate and insulin in an attempt to drive potassium from the extracellular to the intracellular fluid compartments . With the current foal, we chose to initially use glucose in a potassium-free fluid, followed by the addition of sodium bicarbonate. This was eventually successful, likely because the muscle damage was only moderate which resulted in the maintenance of enough intact muscle cells into which potassium could be driven . Interestingly, foals with severe rhabdomyolysis often do not respond to the typical treatments aimed at driving potassium intracellularly, as a result of the severity of the muscle damage and major loss of the intracellular fluid compartments . Thus, in the face of severe muscle damage it has been hypothesized that it may be more efficacious to direct treatment towards enhanced potassium excretion through the renal or GI system . Mineralocorticoids, which act on the renal distal tubules and collecting ducts, and/or diuretics such as furosemide can be used to increase renal potassium loss [4, 8, 17] while polystyrene sulfate, a cation exchange resin, increases faecal potassium loss when given orally or rectally [4, 11, 17]. If dysphagic, it is recommended to muzzle the foal and support it nutritionally using a nasogastric tube in order to prevent aspiration pneumonia. Because the foal in the present report did not exhibit any clinical signs of dysphagia, it was decided to allow the foal to continue to nurse from the mare. Interestingly, a previous report found that three out of four foals diagnosed with NMD developed clinical evidence of bronchopneumonia despite nasogastric feeding  while another report found that 24% of foals with NMD had a post-mortem diagnosis of aspiration pneumonia . It is therefore recommended to maintain foals with NMD on broad-spectrum antibiotics, such as a third generation cephalosporin used in the current case, whether or not the foal is maintained with nasogastric feeding [16, 17]. Because equine neonates should gain 0.5-1 kg per day, the foal was weighed before and every day following the initiation of drug and fluid therapy so as to adjust doses accordingly, and to monitor hydration and adequate caloric intake. Interestingly, large weight gains have been reported in foals 24 hours following the onset of acute rhabdomyolysis , with the mechanism hypothesised to be a combination of activation of the renin-angiotensin system and aldosterone release in response to hyperkalaemia and a large shift of water into damaged muscle [2, 17]. This was not noted in the present case, likely because the degree of muscle damage and hyperkalaemia were only moderate. The prognosis for foals with NMD is guarded, but decreasing CK activity found with serial sampling, such as in the current case, has been associated with a good prognosis . Poor prognostic indicators include clinical signs associated with the acute form of the disease, the inability of the foal to support its own body weight, severe myoglobinuria and cardiac muscle involvement . The acute form of the disease has a much poorer prognosis for survival than the subacute form, with mortality rates of up to 95% while mortality rates for the subacute disease range between 30-45% . The last trimester of pregnancy is the most important time to monitor the vitamin E-Se status of the mare and to supplement if needed . Supplementing the mares in the prepartum period is an extremely efficient way to protect the foals from Se deficiency, since the neonates' Se status depends largely on the status of the mare during pregnancy . When supplementing the mare with Se during gestation, various recommendations have been made including 1 mg/horse/day , 4.4 mg/horse/week  or 6 mg/horse/week . Treating foals at birth prophylactically with intramuscular Se does not prevent NMD acquired in utero , but is recommended in foals from un-supplemented mares in vitamin E-Se deficient regions whose vitamin E-Se status is unknown. Recommended protocols include 2.5 mg Se/45 kg once, repeated two and six weeks later . The Se status of the soil, forage and grain should also be investigated. It has been reported that forage, grain and soil Se levels of <0.1 ppm suggest deficiency . In conclusion, NMD should be included as a differential in any foal that presents with generalised muscular weakness. Confirmation of the disease is made based on the typical clinical signs, elevations in CK and AST, evaluation of whole blood Se, vitamin E and GPx activity and rapid response to vitamin E-Se therapy. Herd surveillance programs with Se supplementation as required are the best ways to minimise the incidence of the disease.